On this page a live coverage blog of the Apple Media Event on October 4th will take place. Apple starts its event at 10:00 AM Pacific Time. The event will be held at the Apple Campus in Cupertino. Keep an eye on this page for updates about the live coverage. Do not forget to fill in your email adress for a live cover reminder, we will be online around 9:00 AM Pacific Time. On this page a live coverage blog of the Apple Media Event on June 7th will take place. Apple starts its event at 10:00 AM Pacific Time. The event will be held at the Moscone Center in San Francisco. Keep an eye on this page for updates about the live coverage. 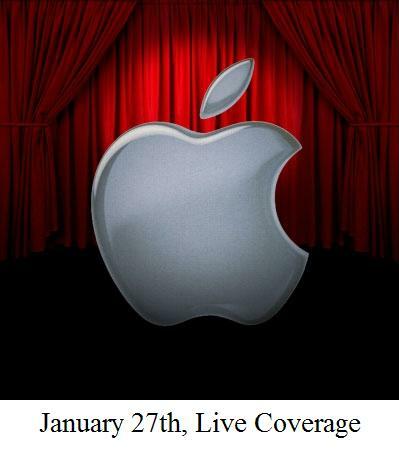 In collaboration with iTabletFreakz.com we will have a Live Coverage of Apple’s special Media Event on January 27th at 10:00 AM Pacific Time on this page. The event will be held at the Yerba Buena Center for the Arts in San Francisco. Hopefully the “come see our latest creation” tag line is suggesting we will finally see the mythical tablet device. It sure looks like this keynote will become very memorable.